Named for 17th-century German botanist and physician Johann Heinrich Von Heucher, the heuchera has enjoyed a surge of interest as gardeners increasingly rely on ornamental foliage for their landscapes. Also known as coral bells and alum root, a native plant that began as a member of the herbal garden has taken center stage in the flowerbed. The flowers of coral bells are small in size, yet exert a significant effect on the wildlife in your garden: both butterflies and hummingbirds will visit the nectar-rich blooms in late spring and summer. Explore ten heuchera varieties that could form the beginning of a new collection in your woodland garden. The presence of contrasting veins on many heuchera varieties expands their color palette and is in part responsible for the introduction of scores of new cultivars in recent years. The lime green foliage with red veins of 'Electra' offers up fun possibilities in garden design: pair it with a red wax begonia or New Guinea impatiens to accentuate the veining. Heuchera 'Venus' is right at home in the white flower garden or moon garden. The silvery foliage resembles stained glass and darker veining pops when you plant 'Venus' with darker companion plants like bugbane (Cimicifuga) or purple shamrock (Oxalis). 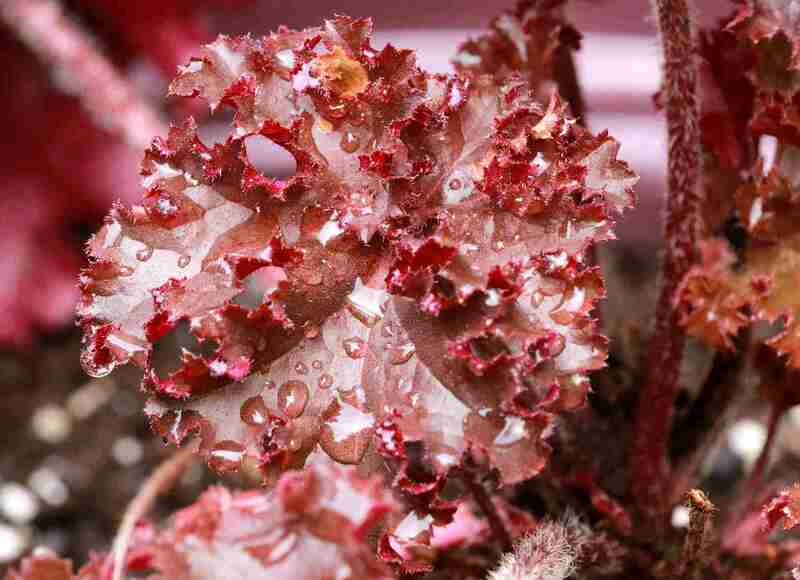 Keep heuchera plants like 'Venus' from experiencing frost heaving in the winter with a three-inch layer of mulch. 'Caramel' coral bells bring a ray of sunshine to the garden with leaves of rust, orange and gold appearing all at once on dense mounding plants that reach 18 inches across. This variety performs well in hot and humid areas, serving as a ground cover, border specimen or woodland garden accent. Water at least once a week to prevent brown leaf margins from detracting from the plant's beauty. Fancy ruffled leaves and mystic purplish-silver leaves that seem to change color in the light make 'Can Can' a lively addition to the partially sunny garden. Like many heuchera varieties, 'Can Can' leaves are bright purple on the reverse side, which makes them attractive from all angles in the garden or as foliar accents in the vase. Heuchera 'Amber Waves' has the lustiest orange hue of any of the coral bells. The plant resembles a mass of the most perfect fall foliage you've ever seen when it emerges. This cultivar performs well even through moderate drought. A partially shady site is best to prevent the magnificent foliage from bleaching. 'Midnight Rose' is a very special plant for the heuchera collector. Not many plants can boast the unusual coloration of deep wine punctuated with a smattering of magenta speckles. 'Midnight Rose' deserves a premium spot in a container on your front porch or deck, where you can observe its unusual coloration at eye level. The green picotee edging on heuchera 'Delta Dawn' is a fascinating departure from the contrasting veining found on many heuchera plants. This variety displays its best coloration when you provide it with a half day of sun, preferably the mild rays of early morning sun. Are you bored with the same old green plants? You won't find a hint of green on this psychedelic wonder, which screams orange, red and purple from every cell, even on its stems. Best to pair this diva with a calming silver or grey plant, to avoid visual confusion.